By now you might be tired of jokes about Spring. Officially, the Met Office has Spring starting on 1st March. There are those who say it starts at the vernal equinox…and that was last week. Or you might think that Spring begins when we move from GMT to British Summer Time. All of these ideas might be challenged by recent experience of our weather. After the odd warm day earlier in the month, the Siberian winds and prolonged spell of cold weather mean it feels more like winter. Nevertheless the clocks spring forward on Saturday night/Sunday morning – the last Saturday in March. This is also the Easter weekend. For those looking to get out and about, things will be happening at Chadkirk over the weekend. Wrap up warm and join in the service in Chadkirk Chapel on Easter Sunday at 3pm.The service will be led by Bernard Sword. The collection at the service will be donated to the chosen charity. This year it was decided to donate to Christie’s via BBC Radio Manchester appeal to raise money for a mobile screening unit. On Thursday April 4th there will be a meeting to discuss the constitution of the Friends of Chadkirk. This will start at 7pm in Chadkirk Chapel. On Saturday 6th April volunteers gather to garden 2-4pm. The Christie charity is delighted to have been selected as the first ever charity of the year partner for BBC Radio Manchester. With your help the partnership aims to raise One Million Pounds to benefit cancer patients in Greater Manchester through a new mobile chemotherapy unit that will take Christie care closer to patients’ homes. We will also be following the stories of Christie patients, staff and volunteers throughout 2013 and there will be a host of fundraising events and activities for you to demonstrate your support. Stay tuned to 95.1fm to hear how the presenter and listeners of Radio Manchester are taking part and how your support will make a vital difference to the lives of cancer patients and their families throughout Greater Manchester. The impact of the double dip can be felt and seen throughout the country. * 18 months ago there were 6 Senior Rangers covering Stockport’s Greenspaces. From April their work will be done by one Countryside Officer. * The Countryside Officer will be paid approximately £5000 pa less than a Senior Ranger. * Alan has changed his green sweatshirt for a blue one. He is now employed by SolutionsSK. He is part of a team of 3. They are based at Etherow and will undertake work in Stockport East. So we will still see him at Chadkirk from time to time. 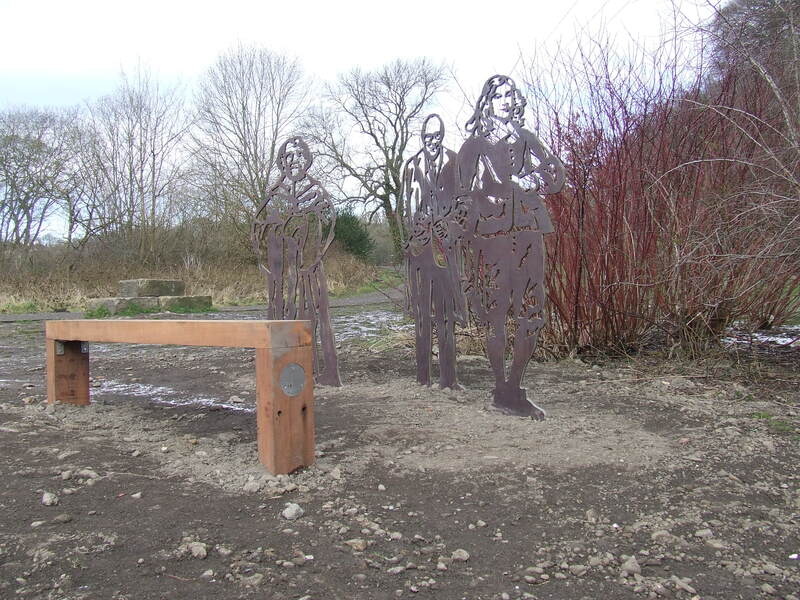 A team of 3 based in Reddish Vale will take care of Stockport West’s Greenspaces. * Work within Chadkirk is often contracted out. The improvements to the path through Kirkwood (from the canal opposite Oakwood Mill to the top of the steps down towards the bridge or gardens ) was undertaken by Utility Landscapes. * Recent woodland management involving felling of 3 or 4 beech trees was undertaken by ECOS and funded by a WIG – Woodland Initiative Grant. At the March meeting of the Friends of Chadkirk, there was a distinct air of optimism. Spring was in the air. On Tuesday the temperature had reached 13 C. Visitors to Chadkirk were able to sit in the Walled Garden and enjoy the sunshine. Somehow that warmth and relaxation seemed to affect the mood of the meeting. Or maybe it was some measure of how pleased we all felt with the news of the recent appointment. As is the way at this time of year, change was underway and the possibility of growth is heartening as winter loosens it’s grip. Recent changes and the prospects of growth featured in many of the items on the agenda of the AGM. There was news of a hedge that was being planted, the installation of the Portrait Bench and woodland management work underway. On the first Saturday of the month, some of the Friends had worked with the Senior Ranger planting a new hedge alongside a wire fence on the Marple side of the river. Gelder Rose, Hawthorn, Dog Rose and Hazel have been planted and John plans to return and do the last 30 metres as soon as he is able. Although the ‘whips’ that went in look more like sticks than a hedge, they will quickly become established and as they grow they will offer a valuable habitat for wildlife. Following the recent interviews, John Rowlands has been offered and accepted the post of Countryside Officer. The 7 days required for appeals has passed so I understand that this information can now be made public. His new role will begin in April. Next time I bump into him down at Chadkirk, I hope to learn more about that role. However, in the meantime, there’s a sigh of relief crossed with a whoop of celebration. It’s excellent news for Chadkirk, as this means that he will continue to live on site. It’s excellent news for Stockport as the people and green spaces will continue to benefit from his skills, expertise and cheerful good humour. And,last but not least, it’s quite good news for John and his family: he will continue to be able to do the work he loves and he keeps his home at Chadkirk. There may be a chance to congratulate him personally on Thursday evening when the Friends of Chadkirk meet for their AGM.